If you like, please thumb up and subscribe! 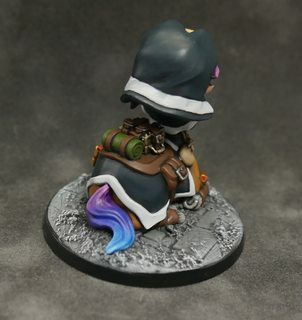 I’ve just finished the Lava Whirl and Celestial Healer from Super Dungeon Explore. I’m trying to improve my glow effects since I keep being asked to make a video on OSL. Ember Hounds from Super Dungeon Explore. I’m finally happy with the glow effect. In this video I show you how to strip paint from models. and Uzumaki. I painted him for the latest Discord painting competition where the theme was “autumn”. In this video I show how I painted Doenrakkar from Judgement. I just finished painting a second Celestial Herald as a gift. She has a slight iridescent effect on her wingtips which doesn’t show up in the photos but you can see it a little in the video. I think she looks better than my own Herald now! I’ve finished the Satyxis Gunslingers. In my latest video I show you how I make my goo bases.